Complete Systems for Coated Fries and other Cut Potato Products. For more than 15 years , Rosenqvists has supplied complete double frying systems for coated French fries and other cut potato products like : wedges, Criss Cut, etc. We supply the complete systems from in feed aligning shaker, batter applicator, batter mixer settling conveyors, fryer infeed belts and the unqiue double frying system. Capacites are ranging from 2 to 20 ton per hour of finished product. Batter applicator : The batter applicator handles both thin clear coatings and thick seasoned coatings with high viscosity. The over flow or submerger configurations can be selected to match your product specification. The batter applicator is connected to the continuous batter mixer, which Controls the temperature and viscosity of the batter to ensure that the correct amount of batter is applied. Settling conveyor : During the transfer on the settling conveyor soem batter are dripped of and collected, During this transfer, the batter have time to settle before entering the first fryer. Double Frying System : The frying takes place in two steps. In Step 1, the coating is set and all products are fried separated. 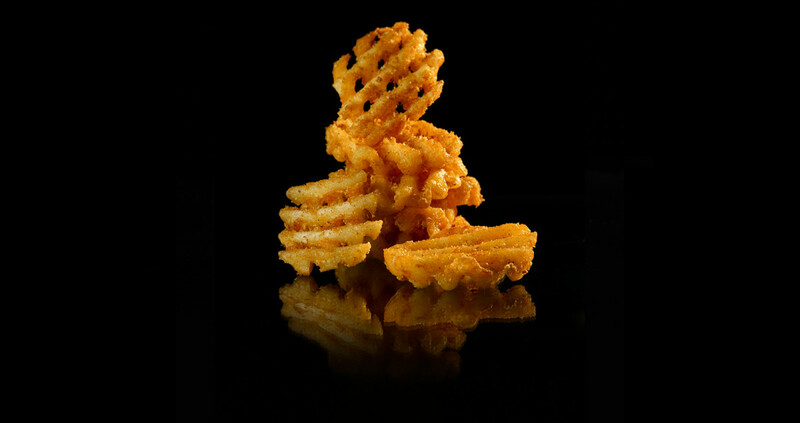 In Step 2, the fries, with a firm coating, will be stacked up as in a conventional fryer. The Rosenqvist double frying system has the lowest amount of oil in the complete frying system. The patented Push-N-Pull drive arrangement of the belt ensure a very long life length of the belt. The belt has built-in scraper , cleaning the full pan bottom every 30 seconds. The laminar oil flow guarantees that the product flow through the first fryer is correct so no product comes in contact with each other, thus creating product lumps. A full flow oil filter with a cyclone fine filter removes all particles from the oil.